You are here: Home > Nokia X2 Prepaid Device Hitting T-Mobile February 16th. 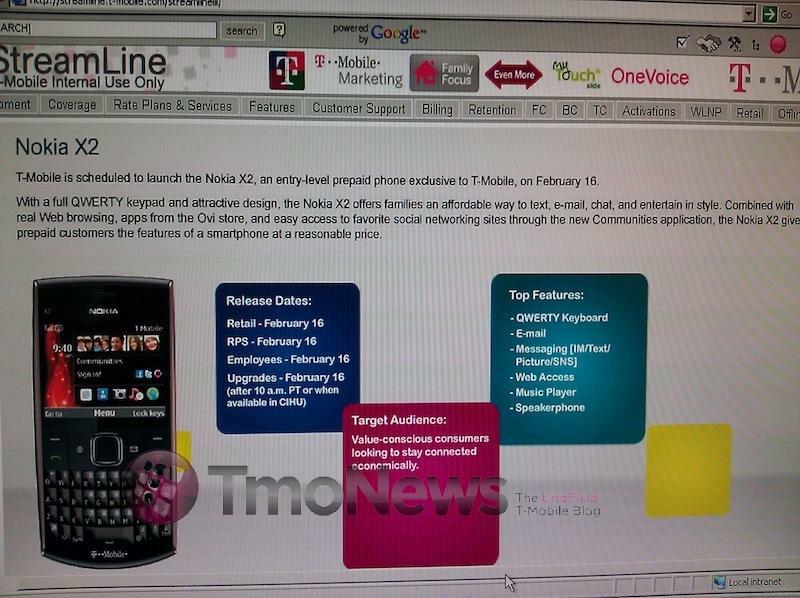 Nokia X2 Prepaid Device Hitting T-Mobile February 16th. I’d like to say I’m not surprised by this in the least as I had all but forgotten Nokia these days. I know how wonderful their phones used to be and how awesome they still can be, if you haven’t seen what the N8 camera can do, thats an injustice. Still, if this is the best they are willing to give the US, I can say for certain I won’t be forking over more money To Espoo in the near future. The Nokia X2 with a full QWERTY keypad, email and messaging features is certainly an attractive prepaid device. Even more so if the price is right but this just makes me sad. Sad for Nokia and what they are offering to the US. If this thing is an EDGE only device, I’m going to cry. Even as a prepaid device, give me 3G. ← (Thursday Night Drawing!!!) Tonight, Tonight, Toniiiiight….The PhoneDog Tablet Giveaway!!!! i have one nokia N8 and i have to said that I’m really surprised of what that phone can do and i really think that the price is wort it, I’m a previews user of IOS and android but this one in every update it’s getting better and better. What about the Optimus X2? AT&T gets the chance to distribute Nokia’s latest and greatest and T-Mobile gets some 2nd rate device made for 3rd world countries. Way to go T-Mobile. Frig those crap phones Give us Tegra Power or give us nothing. Customers, all customers want their carrier to have the latest and best hardware available to them. If they don’t they will go elsewhere. T-MOBILE GIVE US TEGRA POWER, WE WANT AND DESERVE THE BEST. Comparing low-end prepaid feature phones with high-end postpaid handsets, priceless. Um, the N8 works on T-Mobile’s 3g bands. You just have to pay retail for it. Sorry to disappoint, David, but this is what seems to be formally known as the X2-01, which sadly, is EDGE-only. Cry away. It’s not like you are going to be surfing the net with it. Emails don’t need a lot of speed. The big disappointment is no wifi, so no wifi calling. i have the n8,great phone. way to go t-mobile way to go nokia x2. can u guys @ least put the my touch 3g on t-mobile prepaid please?!!! Actually, you can get any of the phones for prepaid from the T-Mobile stores. Prepaid also used same 4G network, so the G2 & MT 4G also work at same speeds. You just have to pay the full price for them without signing a contract. so this is basically a nokia mode, without the mode and without the other things that make it useful? SWEEEEEEEETTTTTTTTT! yeah not interested. This is truly not a Nokia Mode E73, which I have. The Mode is a Symbian smartphone with a 5mp Autofocus Camera with a powerful LED flash, WIFI (including calling), 3g (sometimes, that is due to removing the ability to lock it to EDGE or 3g). Etc. It’s very nice phone how much is it ? The N8 has some great hardware but the problems I don’t like is under powered processor and the screen res. Looking at some video clips the N8 looks pretty damn good. It would be good if Tmo would get the red trimmed one instead of this ugly gray but here in the states they must think everyone wants black, gray, or silver.